East Bradenham tower mill was situated just to the southwest of the older West Bradenham smockmill. The six storey mill was built in 1875 and thus had a relatively short working life. The mill had four double shuttered sails, one pair having 9 bays of 3 shutters and the other pair having 8 bays of 3 shutters. The ten sided ogee cap was horizontally boarded and its petticoat was painted with alternate bands of colour. The cap also had a gallery and 6 bladed fan. A stage was set around the 2nd floor of the tower. Substantially built POST_WINDMILL with brick Roundhouse and five Corn Floors. Also a convenient Messuage or Dwelling House with requisite Offices, Barn, Cottage, Stable, Outhouses and appurtenances. To be Sold by Private Contract. A capital Post_Windmill with patent sails and roundhouse, situated in the Parish of Shipdham in Norfolk. Leasehold for a long term of years. Mr. Butcher is instructed to Sell by Auction at the Kings Arms Hotel, East Dereham on Friday 2nd June 1854 at 3 o'c in 2 lots. A most substantial and powerful Post_Windmill (with brick roundhouse) in a complete state of repair containing five floors, working two pair of French stones, one 4½ feet and the other 4 ft., four patent sails (new), wind shaft with iron neck, head wheel and wallower, spur wheel with iron segments, flour mill, jumper and other requisite going gears, alsoa convenient Messuage or Dwelling House standing in the Mill Yard adjoining the high road leading from Shipdham to Saham Toney, containing ... 0a. 3r. 0p. Leasehold for a term of 999 years at the annual rent of £1. 5/- 75 years only of which are now expired. Land Tax redeemed. Two enclosures freehold arable 7a. 0r. in occupation of Mr. Wm. Stringer and another. Apply Christopher Spanton, Solr. Attleburgh or Auctioneer, Norwich. TO LET in EAST BRADENHAM through the death of the late Mr. W.J. STRINGER, House, Mill, Bake office & 2½ acres of Land. Apply to Mrs. W.J. STRINGER, East Bradenham. Sale to commence at 11 a.m. In Bankruptcy re W. Vout. On Wednesday October 26 th 1910 at 4 p.m.
W.S. HALL is favoured with instructions to Sell by Auction at the Wayland Hall, Watton, in One Lot, THE VERY DESIRABLE FREEHOLD PROPERTY comprising a well built TOWER WINDMILL, with 6 floors and cap and fitted with two pairs of French Burr Stones, 1 pair of grey stones and 1 pair of steel oat rollers, 1 pair of French Burr stones being fitted for steam; and engine house (22 ft. 6 ins. By 14 ft. 6 ins.) with a very pleasantly situated brick and slate built 6 roomed Dwelling house, also brick and slate built 4-roomed Cottage (all under the same roof) with domestic offices, conservatory and the well appointed Bake-house with stables, chaff house and cart sheds adjoining, nice front and kitchen gardens with an artesian well cored 117 ft. and a piece of old Pasture Land containing 2 ACRES, 2 ROODS. The property is situated in the centre of the village and is bounded on the East by the Main Road leading to West Bradenham and Wendling. At Lynn Bankruptcy Court on Monday (7th) before Mr. Registrar Partridge the public examination took place of William Vout of East Bradenham, miller and baker. Gross liabilities £845.7s.11d, expected to rank £532.15s.11d., assets £302.8s., deficiency £230.7s.11d. Debtor said that before going into the milling business with £200 which he had saved, he was an estate carpenter. 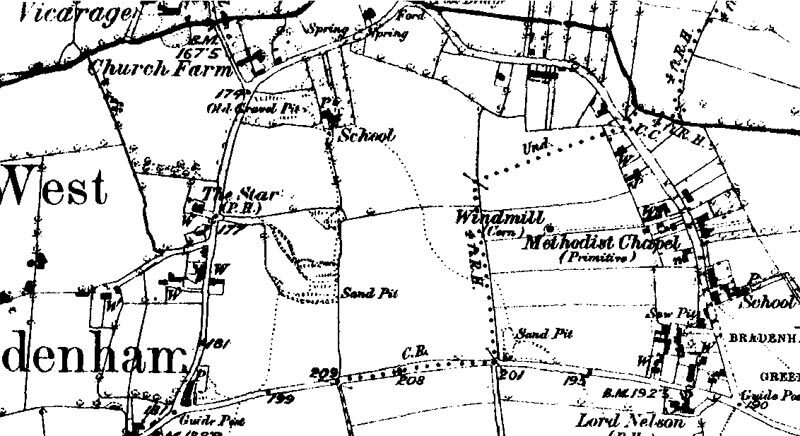 In 1897 he took a windmill and did a grist trade at Wicklewood and he had certainly not lost money when in 1902 he took a house, windmill, other buildings and 2 ½ acres of land at Breadenham. 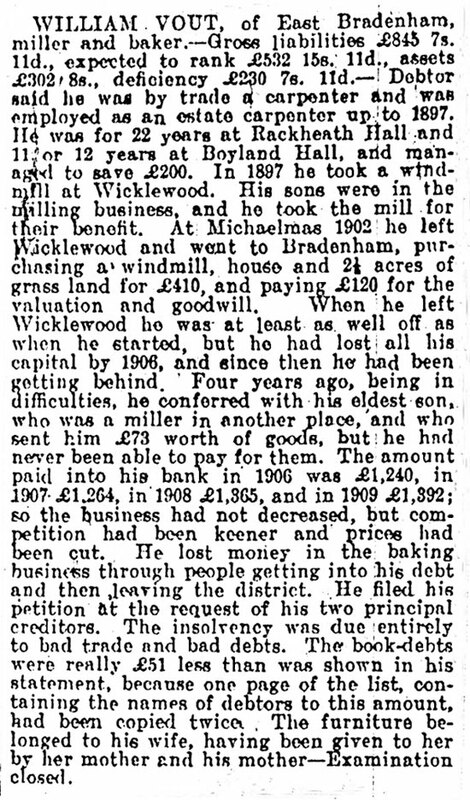 He deposited the deeds with the bank and had an overdraft of £350. He spent a lot in repairs at the outset, lost his £200 and had been in difficulties for four years. A son supplied him with goods amounting to £73 to assist him and they had never been paid for and two of his sons assisted him in carrying on the business, one getting 18s., debtor and another son taking 14s., rent bread, flour and coal for their services; all of them worked in the business. He himself was responsible to the creditors. The income of about £1300 per annum had been maintained, but owing to competition prices had been cut and there were a lot of bad debts connected with the bakery trade. The furniture was his wife’s. The examination was closed.